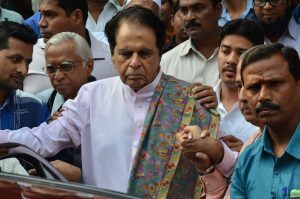 Mumbai (IANS): From veteran actor Amitabh Bachchan to younger talent like Shraddha Kapoor and Abhishek Bachchan — celebrities from the film world on Tuesday wished the legendary Dilip Kumar good health and a long life on his 96th birthday. Dilip Kumar, who is confined to his house due to his frail health, has amassed a huge fan following with his work in films like “Andaz”, “Babul”, “Deedar”, “Aan”, “Devdas”, “Azaad”, “Naya Daur”, “Yahudi”, “Madhumati”, “Kohinoor”, “Mughal-e-Azam”, “Gunga Jamuna” and “Ram Aur Shyam”. As an actor, he last graced the silver screen in 1998’s “Qila”. Amitabh Bachchan: The ultimate master of his craft — Dilip Kumar — Mohammed Yusuf Khan turns 96. Prayers and duas for his good health and happiness always. The history of Indian cinema shall always be written as ‘before Dilip Kumar and after Dilip Kumar’. Shatrughan Sinha: A legend, icon, thespian and an institution Dilip Kumar. Happy birthday! The most outstanding, magnificent and admirable actor of Indian cinema, spanning a career of six decades. A great humanitarian and humble human being. Satyajit Ray aptly named him ‘ultimate method actor’. Subhash Ghai: How can I express this greatest legend Dilip Kumar. Who taught me so many values and virtues of life While making three films with him ‘Vidhata’, ‘Karma’, ‘Saudagar’. He inspired me to set up Whistling Woods International for the next generation. Happy birthday sahib. Abhishek Bachchan: Happy birthday Dilip Kumar sahab. We pray for your happiness and good health. Have a wonderful day. Abbas Mustan: Happy Birthday Yusuf Saheb… Dilip Kumar. Lots of love and happiness. God bless always. Karan Tacker: A very happy birthday Dilip Sahab… Thank you for being such an inspiration to millions! Shweta Pandit shared a photograph, and wrote: Janamdin mubarak (Happy birthday) Dilip sahab. Seen here with my grandfather and his music brother, Sangeet Acharya Pandit Pratap Narayan, they both bonded over indian classical music and ghazals. Dilip Kumar duaas for good health and happiness always.